The Mapes Hotel and casino was built by the Mapes family in 1947. When this hotel opened, it was the first skyscraper built in the western United States after WWII. Most importantly, the Mapes was a model for all large scale hotel casinos to follow. 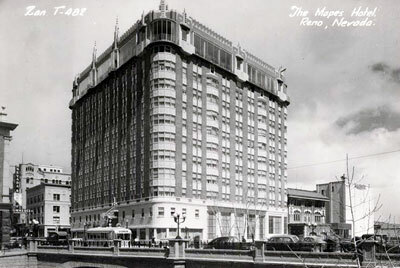 For decades, the Mapes was the place to stay in Reno. Its celebrity guest list included Marilyn Monroe, Clark Gable, Joseph McCarthy, Harry Truman, Frank Sinatra, Jimmy Durante and Milton Berle. In the 1980s, the Mapes family encountered financial difficulties due to their investment in another casino, The Money Tree. With the competition of other high rise casinos popping up all over Reno, the hotel closed on December 17, 1982. The Mapes was placed on the National Register of Historic Places, however it was razed on January 30, 2000. The site is now a park and permanent ice skating rink. Between the years 1985 and 2000, nine National Register properties in Nevada were lost to vandalism, neglect and renewal as reported by Sean Whaley in the Las Vegas Review-Journal dated 6 November 2000.